The demands of both work and parenting are rising. According to the World Bank, women now constitute 40% to 50% of the workforce in many countries around the world, meaning work outside the home is impacting men and women more equally. 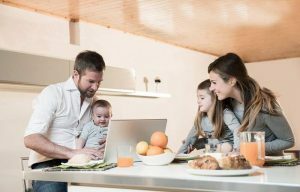 The Pew Research Centre has found that dads now see parenting as being just as central to their identities as moms do, and households with kids are now 66% dual-income, versus 49% in 1970. It is no surprise, given these time commitments, that 50% to 60% of parents find work-life balance difficult. Research pair Jackie and John Coleman set out to advise working parents on the matter. Jackie, being a marriage counsellor, and John, an executive and author of Passion & Purpose: Stories from the Best and Brightest Young Business Leaders, drew on their personal and professional experience. What does each person actually want? Cultural norms still place immense pressure on a couple. After giving birth, some women might decide to take an extended period of time to stay at home with their young child. Nonetheless, they might still feel enormous pressure to return to work. Conversely, many women would love to pursue their careers but feel pressure to stay at home with the children. And men still are often assumed to be better suited to working outside the home, rather than to staying at home to raise a family. Depending on your social circles, there can be overwhelming pressure to prioritise either work or family — navigating an ambitious career or creating flexibility to spend more time with kids. There is no right answer to these questions, but there is a right answer for you and your family. The answer starts with honesty and openness with yourself and each other. What do each of you really want? Ask the question frequently, as the answer may change over time. What roles will each person play? Prior to having kids, it is helpful to be clear about who will be responsible for what, while noting that you’ll likely also need to be flexible and step in for one another when necessary. A simple division of tasks can make day-to-day decisions less stressful. Who pays the bills? Who takes out the trash or does the dishes? Who is responsible for dropping off or picking up the kids from school? Who will stay home from work if the child is sick? How can we stay close to each other? It is important to keep your relationship and each individual’s mental, physical and spiritual health prioritised over all else – including over kids and jobs. John puts these questions out there: “What will prioritising your relationship look like, realistically, in the chaos of work and kids? How often will you go on dates? Can you carve out time for meaningful conversation each day?” This may mean allotting money for a babysitter for one night per week, spending a day away from work to reconnect with your partner, or finding time to share a long lunch together.